Hydra | and sure stars shining . . .
My brief 47 hours in Hydra has reached a conclusion. And I am saddened to leave. Truth be told, I’m ready to get to work. But after the rush of August, two days in somewhat-solitude and demi-paradise was a welcome respite. 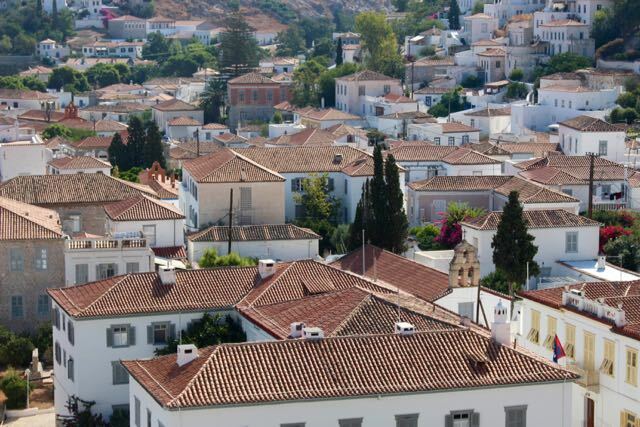 Hydra is a tangle of wonders, and a big bag of ‘I don’t understand how it works.’ The island does not loom large in Greek history until the early 1800s and the battle for independence from the Ottoman Empire. Subsequent history was written in that century and the early 1900s, this time by shipping magnates. Hydra Town itself grew up on the side of the mountain, with twisting pathways wide enough for a mule and person, but not for cars. At some point in the middle of the previous century, the town made the decision to keep motors out of town. And a resort was born, at least of sorts. Movie-makers discovered Hydra at about the same time. So did celebrities. Today, Leonard Cohen’s son owns a house there, as do a couple of soccer players whose names did not register with me. 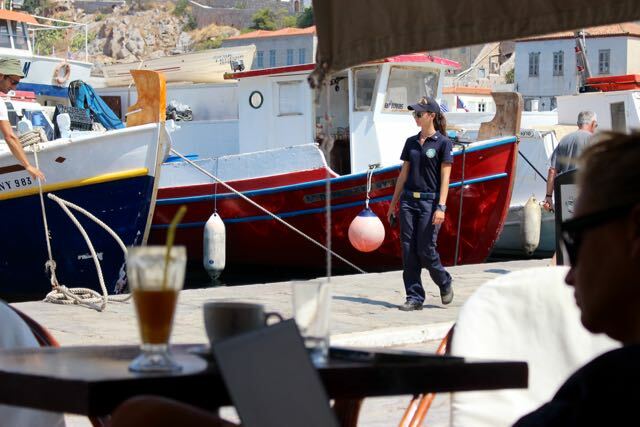 But Hydra Island has no true beaches (just some pebble plots), no modern resorts (but plenty of hotels, from 1- to 4-star, that are open a few months of the year), no year-round source of income. Harriet the Horse Whisperer tells me that local commerce lives on the ‘season’ when restaurants and businesses must make enough money to survive for the seven months off-season. The waterfront businesses literally close up shop; all of those tables and sofas and padded chairs disappear; a couple of taverna stay open for the locals. This beast has loaded onto its back two big concert-sized speakers. “How do locals make a living, then?”, I asked. Well, goods must arrive by boat from the mainland in order to supply the year-round Greek population. Horses, mules, and donkeys move those goods around, their owners making money. (Some kind of animal is needed to pack a new washing machine or sofa up that mountainside!) The local children need teachers for their schooling that is compulsory through age 18. Someone has to look after the mansions. Grocers sell food to the locals. The light bulb shop just up from the bakery will still provide illumination. The apothecary provides goods year-round. And so on. Somehow this all works, but the economic foundation must indeed be precarious. One of the blurbs I read about Hydra spoke of its own self-ordained problems. By deciding not to tear down the town and rebuild in a vehicle-friendly way, the town committed itself to an old-fashioned way of life: pack mules and porters; hordes of visitors disgorged from mainland tourist ships during the season, bringing cash and energy but also requiring a tourist-based economy; no redevelopment since the entire island is a federally-protected environment. I couldn’t help but think today as I sat for one last time at my taverna, eating a ham sandwich and drinking some lemonade, watching a mule being loaded up with boxes from a water taxi, tearing up a bit as the locals stood (lounging in full force on a Sunday afternoon once the huge day-trip ferry departed at 1 p.m.) and applauded a newlywed couple just arriving back from their honeymoon, just how glorious and strange and stuck-in-time this town is. This is truly a town where everyone knows your name — if you are a local. 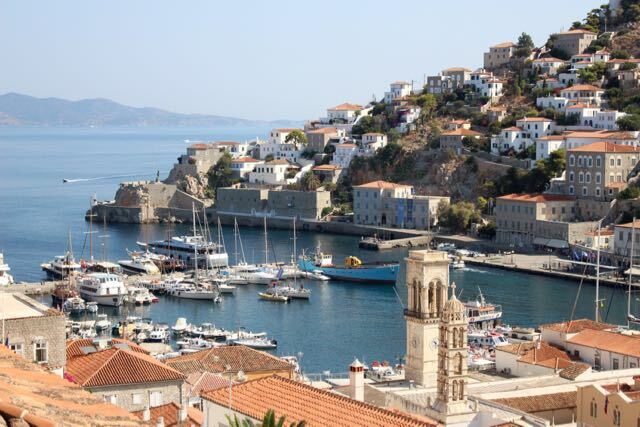 And I’m so glad that my travel specialist back home recommended a weekend on Hydra! 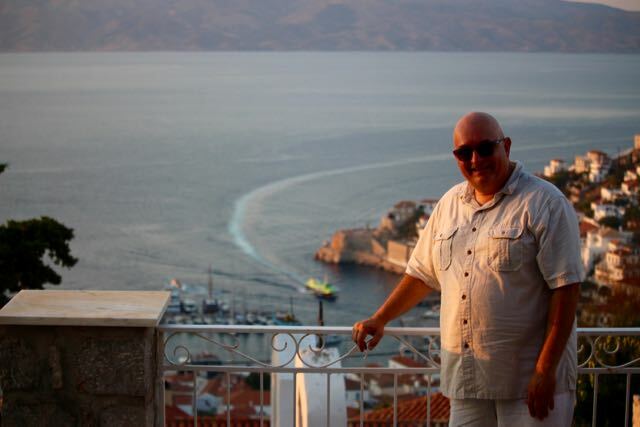 This entry was posted in Travel 2015 and tagged Hydra on September 7, 2015 by Jeffrey Carter. From my hotel balcony on Sunday morning, these sounds of roosters, and of the church bells pealing 7 a.m. This entry was posted in Travel 2015 and tagged bells, Hydra, roosters on September 6, 2015 by Jeffrey Carter. From the Church of St. Konstandinos. Brutal heat drives people indoors during part of the afternoon here on this island. I joined the locals with a retreat indoors for a few hours on Saturday, taking time to nap and to read and to blog. The mid-day heat was truly oppressive! A small local shop was due to open at 5.30 p.m., so I set out to take more photos, work up a sweat, and perhaps shop a bit. I managed the first two tasks with no problem. 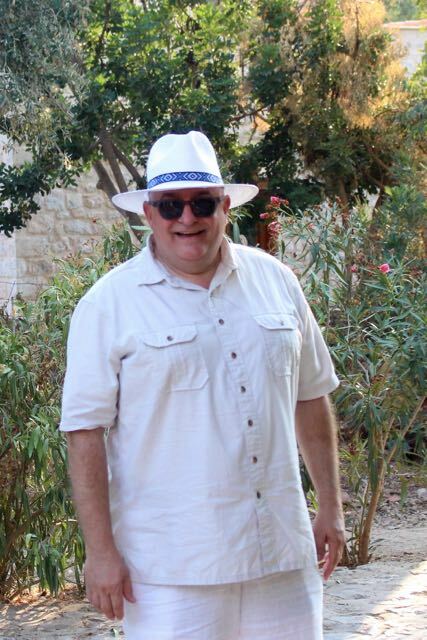 And then I settled in again for a few minutes at my favorite taverna on the waterfront and ordered housemade lemonade, to which I promptly added a packet of sugar. This was decadent and delightful refreshment. My last big hurrah on Saturday was a ride up to an old church on the back of a four-year-old gelding named Andy (I think that’s what Harriet called him). Harriet of Harriet’s Hydra Horses was my guide. We took a winding, switchback trail up the mountainside, emerging at the Church of St. Konstandinos, the patron saint of Hydra Island. We chatted quite a bit along the way, just the two of us on horseback, talking about the local economy, the landscape, her horses, schooling. At the church, an older caretaker let us in for a few minutes. I saw the local soccer field, believe it or not. And all felt right with the world. Harriet was a delightful guide, and extremely generous in that I booked late and she was tired and still added one more trip to her day, in quite a bit of heat. But she was a font of local knowledge, and she put up with this poor middle-aged rider with a smile. I finished the day with pasta and more ice cream (this time lemon cream). And then I crashed hard. Harriet and her crew leading the previous tour back to the stables. The black specks are horses. This island has more than 300 churches and monasteries. Harriet patiently explained a lot of things to me; this idea of so many churches is a relic of faith mingled with historical preservation. Only five priests serve the churches on the island. From my balcony, I can see six belfried churches, plus . . . 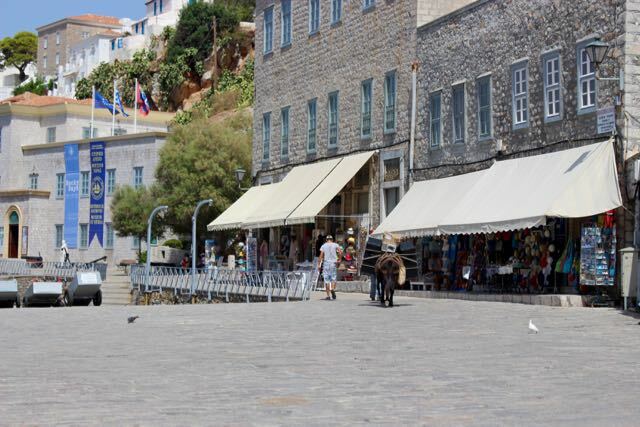 This entry was posted in Daily Life, Food, Travel 2015 and tagged Harriet's Hydra Horses, Hydra, St. Konstandinos on September 6, 2015 by Jeffrey Carter. I can remember a handful of times when waking up in a foreign land was just about the most happy thing in life. I recall opening the window in Brazil to the sight of a mule-drawn two-wheeled cart painted in gaudy colors (this on my first-ever out-of-USA trip); the mist in the valleys in the Genting Highlands in Malaysia; zoo workers receiving their morning instructions, after mandatory exercise, in Beijing; the coast of Greece from an overnight ferry, seen through a cabin porthole; the raucous congregation of birds screaming their hellos in the orchard, just underneath my hotel balcony in Sorrento, with Mt. Vesuvius looming in the background, scarcely visible in the nascent light in Italy. This morning that happiness: roosters — hundreds of them, from the sound of it — heralding first light, and awakening me. Watching the sunrise as I stood on my balcony, eyes to the east over the crest of the 585m peak in the distance. Marveling at the whitewashed homes and buildings, the red tile roofs, the everywhere-you-look peaceful cats. Hydra is a delight indeed. The breakfast spread at the Leto Hotel is sumptuous. I feasted on some sort of local egg concoction, ham (thin-sliced European-style bacon), three kinds of bread (and could have tried 15), a big slice of cucumber, some cheese, white grapes . . . and some of the best coffee I have ever tasted. That this feast was taken underneath a maple tree in a courtyard, with quiet chatter in three other languages all around me, was a bonus. My hotel is smack in the middle of this photo, with the maple tree growing in the courtyard. Yesterday afternoon I just sat at a harborside taverna for nearly 90 minutes, thinking nothing in particular as I watched the world go by. Laziness and heat causes life to slow, sometimes. Such was the case yesterday. This morning, without the heat, I sat at breakfast for 45 minutes and sipped coffee in unhurried silence. And I can feel my contracted mind relaxing, or so it seems. Certainly the left wrist is feeling better — just marginally, but I notice a change. Because sometimes you need some iced tea. Last evening I witnessed something right out of a movie: three older (truly!) Greek women in plain black dresses. They were seated on a bench by the harbor. And they were just taking in the evening peace, occasionally exchanging a few words. Their lined faces were aged with weather and the ever-present harsh sunshine. They were from a world very different from my own; in some way they reminded me of my grandmother whose skin was leathery and wrists were thicker than mine, thanks to daily toil for decades. One does not see power lines here. Somehow the town’s infrastructure has disappeared. OK . . . looking out of my windows, I do see power lines. But not many. And they tend to run along alleyways, high up on the two- and three-story buildings, rather than alongside the few main roads, most of which are wide enough for only two horses anyhow. I visited today the Lazaros Koundouriotis Historical Mansion, a local site, part of the national museum. Koundouriotis was apparently important in the Greek war of independence in the early 1800s. His home is high up on the hillside, and caused me a great sweat on the journey there. Dining room. I want this ceiling so badly. He apparently had but one working eye. Waterfront on a busy Saturday. Part of the city hall complex, much of which was formerly a monastery. From high up on the mountainside. From the battlements by the port. Cemetery on the edge of town. Olives will be harvested in October. Freshly squeezed lemonade — an afternoon refresher. Dinner of pasta & parmesan sauce. This entry was posted in Daily Life, Food, Travel 2015 and tagged bastions, Hydra, Lazaros Koundouriotis, Leto Hotel on September 6, 2015 by Jeffrey Carter.